The Wolf of Wall Street is a 2013 American black comedy crime film directed by Martin Scorsese and produced by Martin Scorsese, Leonardo DiCaprio, Riza Aziz, Joey McFarland and Emma Tillinger Koskoff. 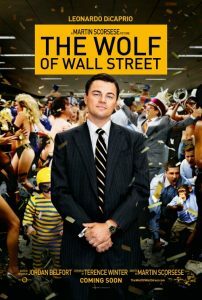 The screenplay was written by Terence Winter and is based on the book, The Wolf of Wall Street by Jordan Belfort. The Wolf of Wall Street stars Leonardo DiCaprio, Jonah Hill, Margot Robbie, Matthew McConaughey, Kyle Chandler, Rob Reiner, Jon Bernthal, Cristin Milioti and Jon Favreau. The Wolf of Wall Street is the story of Jordan Belfort (Leonardo DiCaprio) and his partner Donny Azoff (Jonah Hill) who in the early 1990’s started their own brokerage firm. In 1987 when Jordan was 22 years old, he began working on Wall Street. He began working as a broker and he meets and he meets his smooth-talking, easy going boss Mark Hanna (Matthew McConaughey) and gets invited to lunch with him.